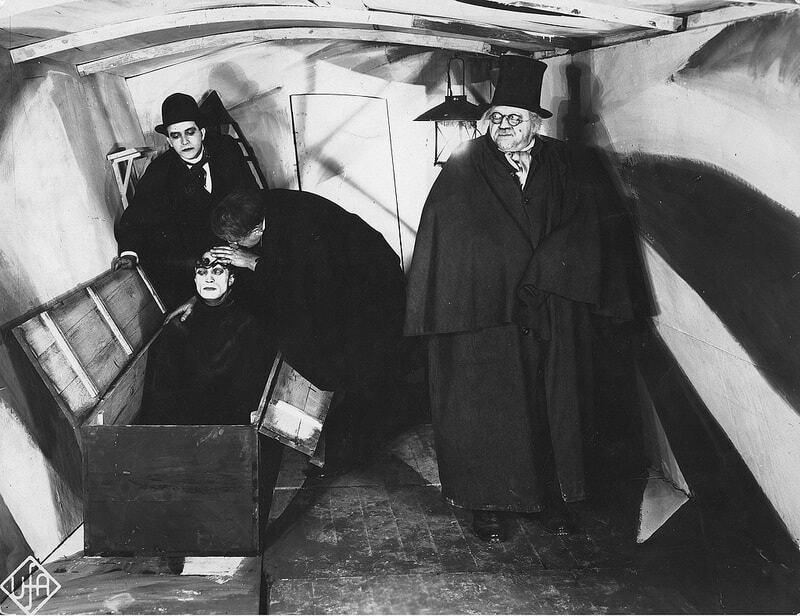 Originally filmed in 1920, Robert Wiene’s Das Cabinet des Dr. Caligari is the tale of murky, warped horror in a dark and twisted landscape. Accompanying the main feature in this superb SteelBook package is the Blu-ray disc 2014 documentary From Caligari to Hitler. 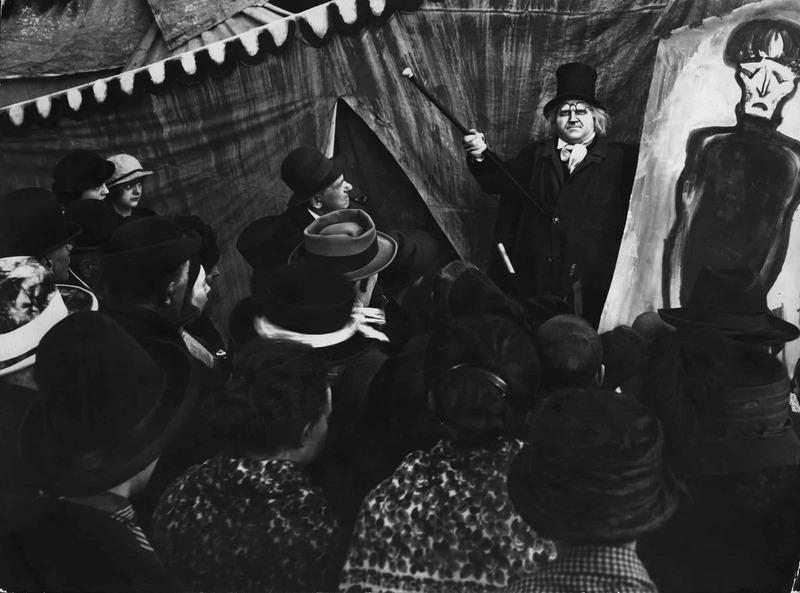 Das Cabinet des Dr. Caligari dawns in a German town as Francis (Friedrich Feher) recounts an unpleasant string of circumstances concerning his fiancée Jane (Lil Dagover). Francis and his friend Alan (Hans Heinrich von Twardowski) both wish to win Janes’ heart. They agree to let her choose between them, but before she can make up her mind they visit a mysterious carnival. 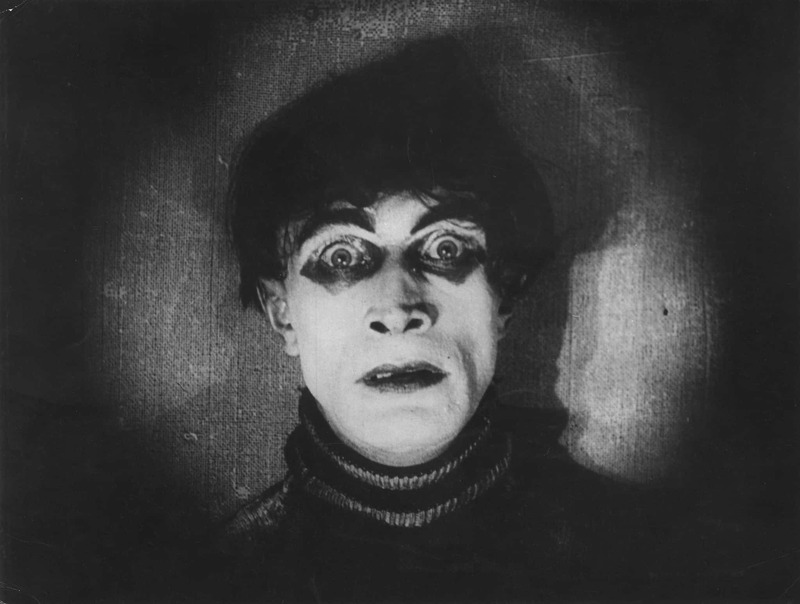 They make the mistake of entering the tent of Doctor Caligari (Werner Krauss) to view Cesare (Conrad Veidt), a sleepwalking somnambulist. The monochrome wraith predicts Alan will die and before dawn the prediction has become true, leaving Francis grief stricken and determined to exact revenge on his friends’ murderer. 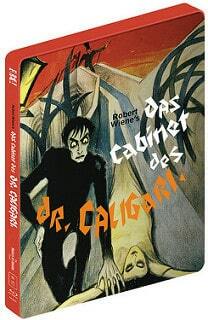 Das Cabinet des Dr. Caligari is a nightmare in an ominous landscape influencing a plethora of media from film and stretching into music including the likes of Rob Zombies’ Living Dead Girl music video. Angular antics abound in a surreal landscape disorientating the viewer in a confusion of twisted gothic imagery. Despite the lack of crimson this crazed flick enjoys stunning imagery and cinematography stylishly interlaced with menace. With necropolis ambience and focused direction this is an accomplished work paying attention to character nuances. This is indeed a bizarre movie oozing melancholy, frightening subtext with a haunting pervading sense of tragedy. It’s gothic horror at its finest, intertwining death and romance within a framework of extremely beautiful visual imagery. This movie creates a strange and vertiginous experience, exploring the concepts of salvation and damnation to produce a compulsively enjoyable occasion. This SteelBook special, features a new high-definition presentation from the extensive FWMS restoration with an option of both Stereo and 5.1 surround scores. Included is a two hour documentary From Caligari to Hitler, covering German Cinema during the Weimar Republic (1918-1933). More goodies include the original German intertitles with optional English subtitles and a new and exclusive audio commentary by film historian David Kalat. Further extras include You Must Become Caligari, a new video essay by film critic David Cairnes. Crammed in is Caligari: The Birth of Horror in the First World War, a fifty two minute documentary covering the films impact. On The Restoration is three short video pieces reflecting on the film’s restoration. The icing on the cake is a forty four page booklet featuring vintage writing on the film by Lotte H. Eisner. Finally the haul contains an original variety review of the film, rare archival imagery and a trailer for the new restoration. Eureka kindly brought out this stunning definitive restoration Limited edition 2- Disc Blu-ray SteelBook on the 16th January 2017. I was lucky enough to get a chance to review the Blu-ray in the steelbook, its a delightful high quality item of excellent picture quality. The combination of quality production, sheer mass of extras and 44 page booklet will make this the pride of your collection.